This edge of your seat debut novel by Samantha Downing is a total crowd pleaser. Fast-paced and compulsive to read, My Lovely Wife is a story about a bored husband and wife who decide to shake things up to keep it interesting. I won’t get too into the summary of the story- you get the gist from the blurb. I love that the book was written from the husband’s point of view. His inner monologue is written in such a way that keeps you turning pages way past your bedtime. Downing has an interesting way of being creepy and disturbing without being graphic or gritty. The implications woven throughout the story are enough to paint quite a picture of this devious couple. She shares just enough detail to hook you but leaves so much up to the imagination. And even though this is a debut, Downing makes a splash with not only her storytelling but also with her quality of writing. She writes a great story. 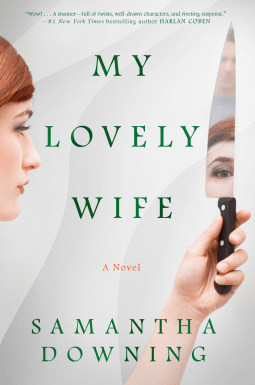 I didn’t particularly care for either the husband or the wife- but that’s also one of my favorite characteristics of the best psychological thrillers. These characters are messed up, twisted, and completely deplorable. Not only did I feel like I knew this husband and wife (they’re your neighbors, tennis partners, your realtors, your kids’ friends’ parents) but their kids added just enough drama and intrigue to add complex layers that seemed to jump right off the page. I have to mention the ending. I LOVED it. It was perfect. I didn’t see it coming and make sure you read to the very last line of the story. It just might make the little hairs on the back of your neck stand at attention. I’m definitely looking forward to more from Samantha Downing because while this is a fantastic debut, I can tell she’s only going to get better from here! Samantha Downing currently lives in New Orleans, where she is furiously typing away on her next thrilling standalone. My Lovely Wife is her first novel.